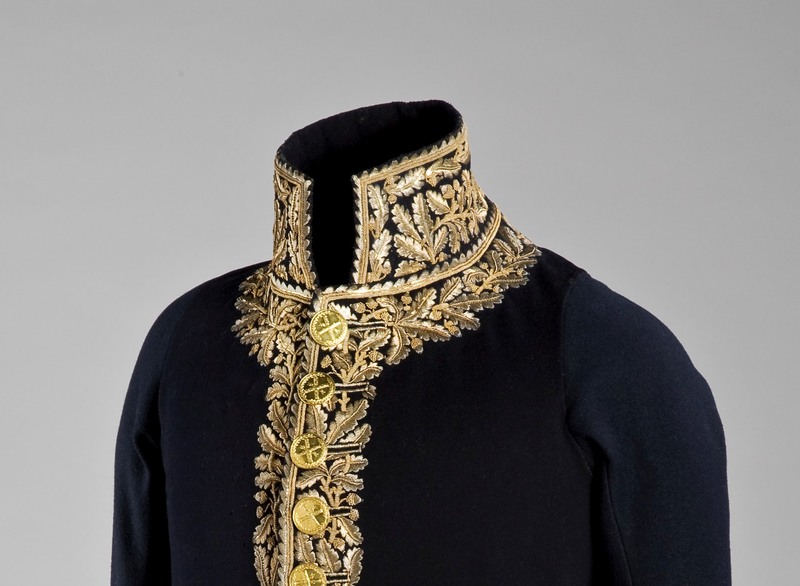 When we visited the Rosendal Palace back in August, they had on display this mouth-watering tailcoat. Having seen it in various publications over the years it was interesting to see it in real life. 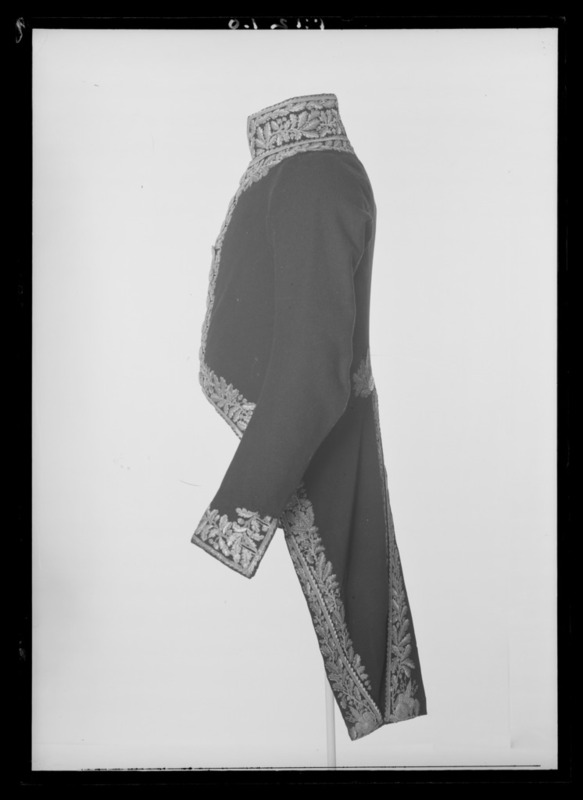 It is a tailcoat in the formal court style as seen in many countries from the late 18th century and well into the 20th century. Variations of it is worn even today both here and there. This particular coat once belonged to the Marshal Bernadotte of the First French Empire, later King Karl XIV Johan of Sweden, and founder of the Bernadotte dynasty. 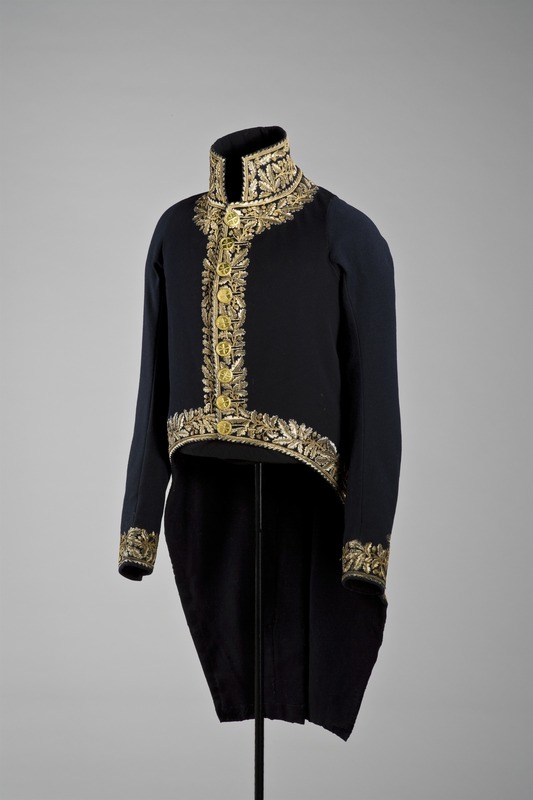 A dark blue single breasted tailcoat, with embroidery in gold depicting oak leaves and acorns. The buttons have marshal´s batons in the shape of a cross surrounded by laurel and oak leaves. France, 1804-1810. The Royal Armory, Sweden. 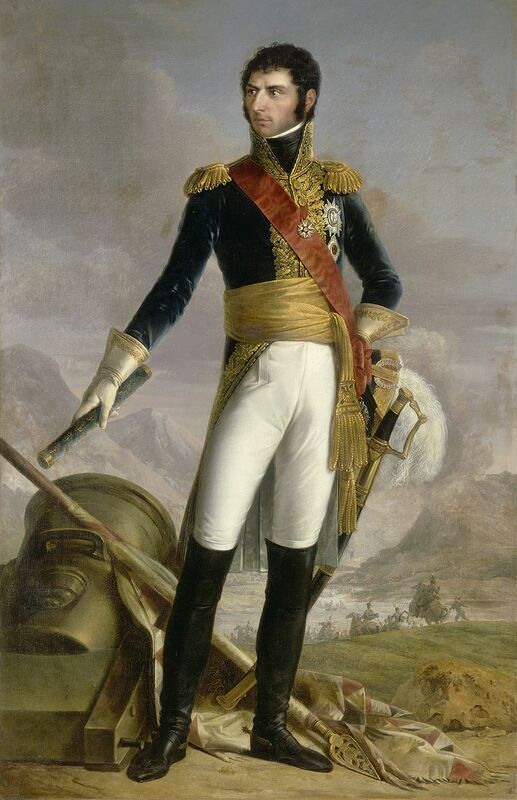 The coat (or a version of it) on its original owner, the dashing Marshal Bernadotte, Prince of Ponte-Corvo, and sometimes referred to as “Belle-Jambe” (“Pretty legs”). Painting by Joseph Nicolas Jouy, after François-Joseph Kinson. Notice the impressive black neck-stock, the feathered bicorne, and insignia – such as the Legion of Honour – and the marshal´s baton, a blue cylinder with stars and eagles (introduced during the First French Empire). It has the Latin inscription: Terror belli, decus pacis, which means “terror in war, ornament in peace”. Jean Bernadotte (1763-1844), born in the town of Pau, France, into a modest bourgeois family, was a self-made man and had one of the most extraordinary careers ever. He rose to the rank of general in the turmoils of the French Revolution. In 1798 he married Désirée Clary, the daughter of a successful merchant in Marseille, and whose sister was married to Joseph, Napoleon’s elder brother. Mademoiselle Clary herself was Napoleon´s former fiancée. On the introduction of the French Empire in 1804, Bernadotte became one of the eighteen Marshals of the Empire. He served as governor of the recently occupied Hanover, and as a reward for his services at Austerlitz in 1805 he became the Sovereign Prince of Ponte Corvo the following year. Napoleon could not fail to respect Bernadotte´s talents, both as a general and as an administrator, but he found his independence extremely vexing. Perhaps in an attempt to get rid of him, Napoleon offered Bernadotte the position of governor of Louisiana. It never happened. In 1810, as Marshal Bernadotte was about to travel to Rome to take up the role of Governor General, he learned that he had been elected Crown Prince of Sweden (as the Swedish King was childless). The Swedes chose to overlook Bernadotte´s humble origins thanks to his qualifications, his personal fortune, and his position as one of the most loyal allies of the French Emperor. The Bonaparte saga was short, but the Bernadotte dynasty is still standing in Sweden, and its descendants are to be found in the Royal families of Denmark, Norway, and Belgium. A closeup showing the guilt buttons and the embroidery. In this older photograph the coat looks rather worn. The report says the sleaves were altered or restored. Interesting to see a glimpse of the embroidery on the tails. The coat was obviously never worn in Sweden, but ended up in the collection of the Royal Armory. Click here for a link to info on the database for Swedish museum collections.